Sera Devi showed psychic aptitude from the day she was recruited into the Academy of Law at age 5. However, until she was 16, it seemed to be nothing but a minor talent she could use to make others see her in a more positive light. It wasn't until a jealous classmate attempted to frame her for cheating in a test that her powers truly blossomed, allowing her to see, and share, the truth of the matter with her superiors. Terence was almost immediately removed to the custody of the Justice Department to be trained as a Tek Judge. Cadet Novak received a commendation when he used his mechanical skills to assist noted Judge Jack in the arrest of a disaffected cadet who attempted to destroy the academy with an improvised explosive device. Since becoming a qualified Judge, Novak has not missed an opportunity to remind his peers of his achievement, a habit that has not made him popular with with his fellow Judges. Judge Jessica Morris has, in her short time on the streets, become feared by the local street gangs in her assigned sector. This has been mostly achieved through an uncompromising attitude and liberal use of her daystick. As a cadet she always excelled in the Applied Violence classes and as a rookie was assigned to Judge Ocks. Ocks, while young for a Senior Judge, is well known within Justice Department for using his formidable physical strength in confrontations with perps. Unsurprisingly his rookie has followed his example in becoming a scourge for the city’s street thugs. Judge Morris is currently awaiting reassignment having successfully tracked down a kidnapping gang operating in the sector. While it is possible she has brought all those perps to justice, she is almost certain that some of the gang escaped and is currently on the lookout for any leads that might bring them within her grasp. Grown as a clone, all Judge Clayton Halsey has known is the Academy. His fellow cadets and Judges are his family and, like all Judges, he is fiercely loyal in his belief and commitment. feelings cause him anxiety at times as he struggles between his fierce loyalty and belief, and his inner anger and resentment. Year 2099. Judge Dredd is the most well known and feared Street Judge in Mega-City One. Already his toughness is legendary and any sector he is assigned to soon sees a noticeable drop in crime figures; many local perps will lie low to avoid any chance of coming up against him. A clone of Judge Fargo, the father of the Judge system, Dredd was involved as a cadet in the struggle against the corrupt President Booth, and a few years later started patrolling the streets as a full Judge. Dredd’s uncompromising nature and experience has made him a trusted figure with the Chief Judge and he is often given the most dangerous assignments to complete. Year 2099. Judge Anderson is a young Judge, fresh out of the Academy of Law having only recently passing her rookie evaluation. Anderson was recruited because of her natural psionic potential. Anderson can be flippant, and is perfectly willing to criticise her superiors, teachers, and institutions. Many options are available to Judges in the Justice Department. 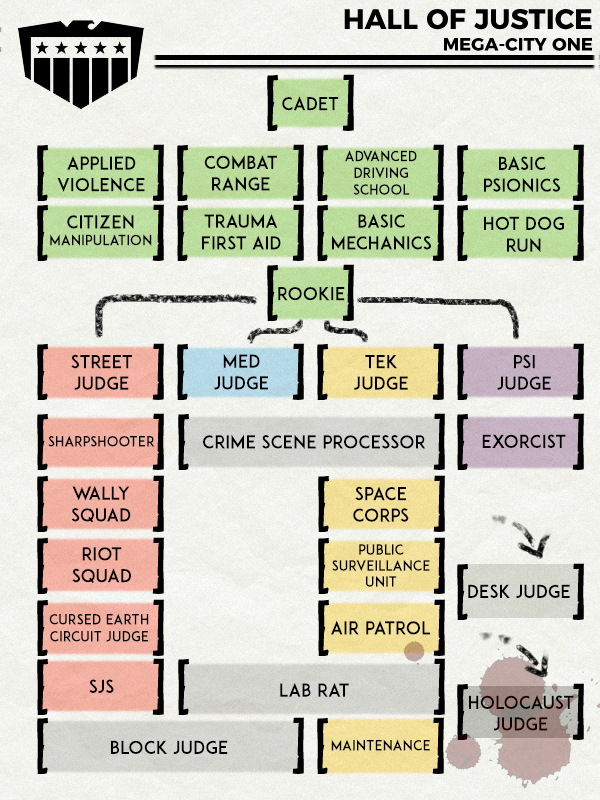 A Judge is recruited into the Academy of Law at the age of 5 as a cadet, and then put through the world's most intensive training program. After 15 years, including choices of advanced courses, the cadet undertakes a rookie evaluation under the watchful eye of a supervising Judge. The few who make it through this evaluation are then assigned to the Street, Med, Tech, or Psi departments, with opportunities for a variety of more advanced roles later on. Some careers will be introduced later in the timeline.